Description of the classes listed below the fitness schedule. The schedule may be subject to change. Classes are 1 hour unless specified otherwise and are designed to accommodate all levels. Please allow yourself a full hour. Equipment and supplies are available. We respectfully request that you clean your equipment after use. Extreme Burn - 80 min. * = Prior sign up is required. Core and Cardio- The cardio portion is a walking routine (weather permitting). Always wear proper footwear. Closed toe shoes are advised. HIGH Fitness - is an emerging leader in group fitness, inspiring people from all walks of life to a lifestyle of better health and overall wellness. HIGH transforms old school aerobics into a highly addictive new fitness experience that combines simple, modern fitness techniques (i.e. HIIT, plyometrics, etc.) with music you know and love. Kid's Fitness Class - a class for kids ages 7-14 that increases strength, flexibility, and mobility with the use of body-weight and other forms of resistance. and shoes. Senior Stretch- a class for everyone. 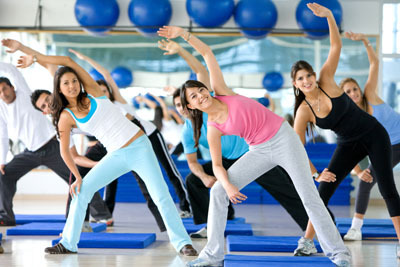 This class will focus on balance, posture, light weight work, low impact aerobics and stretches. The goal of this class is to rehab you before you need it. Soul Body and Barre- a one hour, mindfully intense class broken down into 9 blocks of dynamic exercises using small isometric movements that work deep into the muscle, seamlessly transitioning to deep stretches to balance the body. Pulling from the principals of Pilates, the wisdom of yoga and the intense power of dance. Spin class- An instructor guides you through the workout phases. The workout will be set to motivating music and will be a combination of warm-up, steady up-tempo that runs thru sprints, climbs and, cool downs, etc... You have control over the intensity of your own bike throughout. *Prior sign up is required. Torch Class - Are you ready to get your sweat on? Melt off some serious calories with this intense cardio strength training interval combo class. Finish work and then come workout with us. This class is rated as a moderate to hard level of exercise. Zumba-is based on Latin, international and popular music and dance moves but you don't have to be a dancer! Whether you want to lose weight, get in shape, or just be a healthier you, Zumba is the class for you! Come join the party.